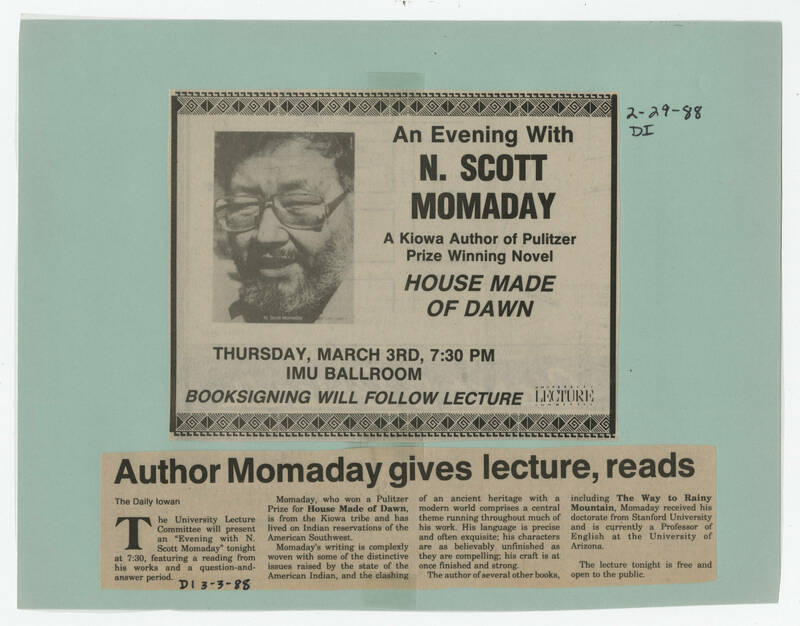 [[Handwriting]] 2-29-88 DI [[End handwriting]] [[First clipping]] An Evening With N. SCOTT MOMADAY A Kiowa Author of Pulitzer Prize Winning Novel HOUSE MADE OF DAWN THURSDAY, MARCH 3RD, 7:30 PM IMU BALLROOM BOOKSIGNING WILL FOLLOW LECTURE [[End first clipping]] [[Second clipping]] [[Header]] Author Momaday gives lecture, reads [[End header The Daily Iowan [[Handwriting]]DI 3-3-88[[end handwriting]] [[Article Text]] The university Lecture Committee will present an "Evening with N. Scott Momaday" tonight at 7:30, featuring a reading from his works and a question-and-answer period. Momaday, who won a Pulitzer Prize for [[bold]]House Made of Dawn[[end bold]] is from the Kiowa tribe and has lived on Indian reservations of the American Southwest. Momaday's writing is complexly woven with some of the distinctive issues raised by the state of the American Indian, and the clashing of an ancient heritage with a modern world comprises a central theme running throughout much of his work. His language is precise and often exquisite; his characters are believably unfinished as they are compelling; his craft is at once finished and strong. The author of several other books, including [[bold]]The Way to Rainy Mountain[[end bold]], Momaday received his doctorate from Stanford University and is currently a Professor of English at the University of Arizona. The lecture tonight is free and open to the public.